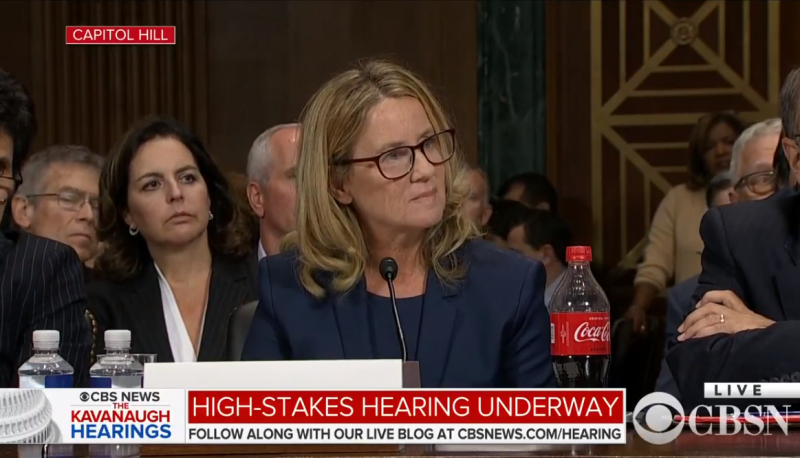 On Capitol Hill this morning, Dr. Christine Blasey Ford testified before the Senate Judiciary Committee about her allegations that Supreme Court nominee Brett Kavanaugh sexually assaulted her in 1982, while he was drunk at a party. In real time, right-wing media relentlessly attacked Blasey Ford. Right-wing media outlets spent the week and a half before Blasey Ford’s hearing waging a campaign to destroy her credibility, often by citing bogus nonsense. This morning, those same media figures continued their smear campaign throughout the hearing. You have destroyed a man’s reputation and made extremely serious accusations and you cannot provide corroboration to your claims. I legitimately feel badly for Dr. Ford. Not only is she clearly suffering, but it seems many involved here — Democrats and *her own attorneys* — have taken advantage of her in order to execute a bigger plan. This is not how you treat a human being. The New York Times columnist Bari Weiss seemed to mock Blasey Ford for telling senators she felt it was her “civic duty” to come forward with her claims in a since-deleted tweet. Really impressive to see journalists confirming the basic spin they already put on this two weeks ago. She’s emotional, so she must be telling the truth. The GOP is all white men, so they come across terribly. Kavanaugh must be guilty. Dr. Christine F. Ford was all smiles. This is a moment the Democrat Party has schemed for – to smear a good man, try to destroy his career and his livelihood. All to advance their ideology of endless abortion. This Senate Execution is an affront to decency. This is sad. Ford comes across as childlike. She clearly has a LOT of PTSD. She comes across as someone who has suffered much abuse in her life. Who is paying for her lawyers? Who is paying for all of this? This lady should be imprisoned for lying to Congress.